This sounds like fun: the Columbia Heights Initiative, a great local group that organizes events and community-building activities (like Columbia Heights Day and more), has organized a community Easter party including Easter Egg hunts for kids and food from local restaurants and businesses for this Saturday at the Columbia Heights Rec Center, 1480 Girard Street NW. There are two separate hunts for little kids and bigger kids, as well as a raffle for everyone. And they need more volunteers! 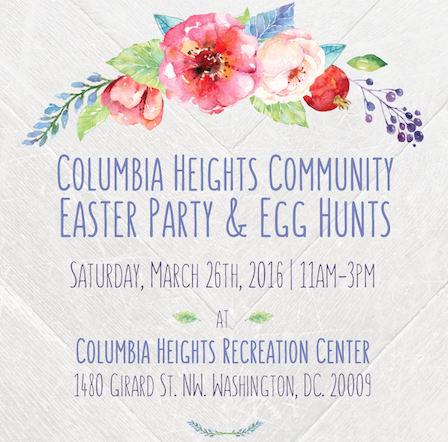 Join the Columbia Heights Initiative in partnership with Grace Meridian Hill and the Columbia Heights Recreation Center (1480 Girard St NW) for a Neighborhood Easter Party on Saturday, March 26th from 11am to 3pm. This beloved event has been hosted by Grace Meridian Hill Church for the past five years and we are excited to join forces this year! We have over 3,000 Easter eggs and will host two Easter egg hunts, one for tiny tykes ages 0-7yrs and one for the big kids ages 8-14yrs. Thanks to all of our Early Adopter Annual Partners who have already pledged their support of our work this year. It is because of them that we are able to host these great events!